Your Dentist in Frisco Says Bacteria and Pancreatic Cancer are Linked! In part three of this four-part series on the connection between oral bacteria, gum disease and overall health issues, we focus on how the foregoing contribute to pancreatic cancer. This finding is, again, based on the concept of oral systematic connection, which we’ll revisit in this piece. As you read on, your dentist in Frisco will not only discuss this problem, but will also provide ways to prevent it from happening. For there to be a conclusion drawn that what happens in your mouth is related to the health of the rest of your body requires a methodology and series of tests. The research that falls under that umbrella is referred to as oral systematic connection, which moves under the premise that what happens in the mouth affects the rest of your body. This is a pioneering field of research for both medical and dental professionals because it reinforces the necessity of both groups to share data and to broaden their perspectives on both prevention and treatment strategies. The connection between poor oral hygiene and pancreatic cancer has a bridge – gum disease. Orally, this is one of the crescendos that prolonged negligence can lead to, where the gums become inflamed, swollen and bleed easily. Allowed to linger, the problem escalates to periodontitis (an advanced form of gum disease), where the gum tissue becomes severely infected. Since gum tissue is where the oral blood and nutrients are housed, if the health there is compromised, then the blood is too. Thus, as it flows to other parts of the body, it creates disharmony. How is Gum Disease Related to Pancreatic Cancer? Recent studies conducted by a research team from Harvard School of Public Health found that advanced gum disease causes an increase in the levels of carcinogenic compounds in the mouth, called nitrosamines. 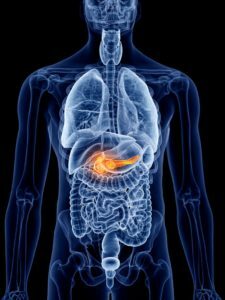 They propose that the latter reacts with digestive chemicals in the gut in a way that contributes to the development of pancreatic cancer, which can be fatal. Thankfully, this can be prevented through practicing some simple disciplines. Practicing Excellent Oral Hygiene – Brushing your teeth thoroughly for two minutes and flossing consistently will remove a great deal of the bacteria that are instrumental in the development of gum disease and also contribute to the appearance of pancreatic cancer. Maintaining Regular Visits to the Dentist – To eradicate the plaque and tartar that you can’t address at home, your dentist is available to remove it for you at your semi-annual visits. While there, the trained professional will also assess the condition of your oral health. If any issues are discovered, they can be treated before they mushroom into greater problems. A great deal of your oral and overall health comes down to being proactive. Your daily and semi-annual efforts will allow you to enjoy the fruits of better overall health. To schedule a preventive care visit, reach to your Frisco dentist today. Since graduating from Baylor University in 1995, Dr. Jill Wade has been a positive force in the dentistry world. She is frequently featured on TV, radio and print and is an accomplished author as well. Dr. Wade helps patients experience healthier lives at Stonebriar Smile Design and can be reached for more information through her website. Comments Off on Your Dentist in Frisco Says Bacteria and Pancreatic Cancer are Linked!